Confer's Jewelers is the fun jewelry store where everyone feels loved. Monte and Brenda Confer started Confer's Jewelers in 1977 in Potters Mills, PA. They purchased the business from Monte's father. 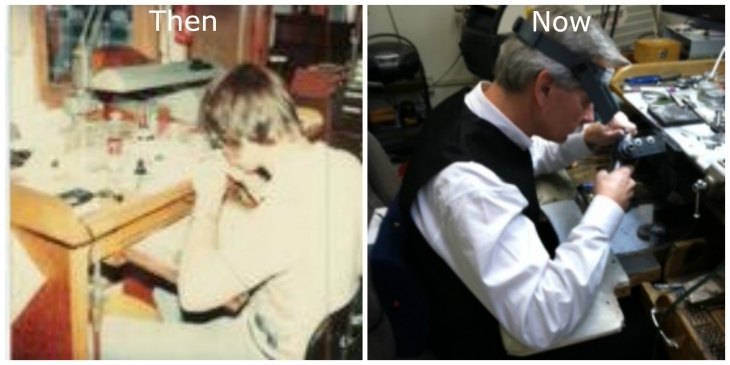 They began as a watch and clock repair shop. Monte would do the repairs and Brenda would help the customers while she was taking care of their 3 daughters. In 1985, they moved the business to Bellefonte where it currently is. They had $2500 in inventory, mostly gold filled and 10 karat jewelry when they opened on April Fool's Day. They grew little by little and hired someone part time to help. As more customers became repeat customers and began referring their friends, they continued to grow. When their daughters, Tiphanie, Monteca and Eliza started high school, they worked part time at the store. All three girls have worked full time at Confer's throughout the years. However, Tiphanie and Eliza have both moved away leaving Monteca in charge. Monteca had decided she wanted to be a Physician's Assistant and began college. After she came home to work for her first Christmas break she realized that her passion was jewelry and the family business. She began working full time at Confer's in 1999. Monte and Brenda retired in 2018 and Monteca and her husband, Dan bought the business from her parents. They are continuing the Confer's Legacy of love and beautiful jewelry!